I can’t believe I forgot! I was so determined to get in gear and get to visit Mom before the next storm, I completely forgot! Then we had no internet until just a few minutes ago, so I could not rectify the situation. Friday I did make it to Mom’s, even though it was snowing when I got up. By the time I got to Rockport, it was rain, and it rained all day down there. Mom and I hung out a bit (like while she ate breakfast. I DID get there early!) 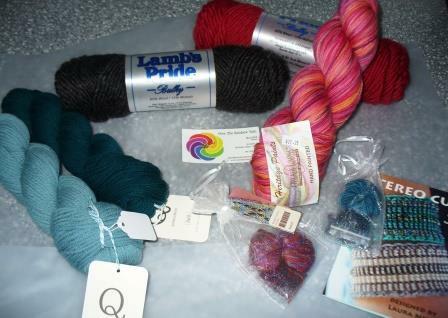 and then went into town (Rockland) to do some errands, and go to the yarn store – Over the Rainbow. They carry Quince and Co yarn now! Oh boy. they also carry Laura Nelkin kits and patterns, so I was able to do some serious damage to my yarn stash money. Like wipe it out. The Quince and Co Lark yarn in peacock and birds egg is, I think, for a color work cowl that I have yet to either invent or find the perfect pattern for. 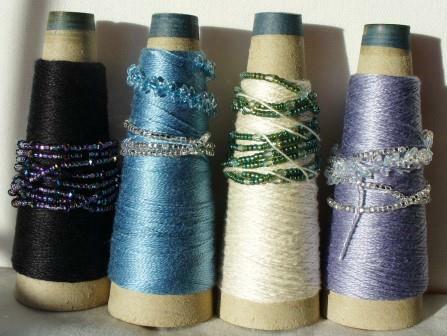 Then there are two precious Laura Nelkin bracelet kits, Stereo Cuff, and a lace beaded cuff (the name of which I can’t remember). While we were oohing and aahing over the selection of her kits, Mom asked me if I would make some earrings for her to give as a gift. Well, duh! I will dig through my beads and see if there are some that will work, but if not, then I will find a few pennies and head to the bead store in Bangor when I am there next week for taxes. One thing (of many) that I love about Laura Nelkin’s kits is that she very clearly outlines what is needed – what size beads, how many, etc, so after you make the one you bought, it is pretty easy to come up with your own colors and designs, based on her pattern. Anyway, after getting all that lusciousness, we had a good lunch at the Brass Compass and headed home, where we worked on a puzzle with B before I went back out into the storm. Heading north again around Penobscot Bay, the rain turned to snow in Camden, and it was slow going after that. I stopped at the big grocery store in Camden and did the shopping for the week, and still got home by supper time! Today was a day for shoveling and knitting, and I did both. Some work on the blue sweater, the orange baby sweater, and I knit one of the necklaces I strung earlier this week. I’ll share photos of all of that tomorrow, when they tell me the sun will shine, so you can see the work. I also spotted a new bird at the feeder, and while I didn’t get a photo, I can describe it pretty well so that you smart people can tell me what it is. Tiny, and clearly striped, but with a red breast. It looked a lot like the purple finch in my bird book, except that the head was not red. Tiny like that, though. The Pine Siskins in the book don’t seem to have any red, and so I am lost. Tomorrow Mom and B will stop by on their way home from church (they go occasionally to Cherryfield, and sometimes we are home when they come by. Tomorrow we made a plan to be sure we are, and we will all go out for brunch. Other than that, I think it will be more shoveling and knitting…. Author salpal1Posted on January 31, 2015 January 31, 2015 Categories how I spent my day, what I am making, what I am thinking about making, What's on my needlesTags Belfast, family, knitting, Laura Nelkin design, over the rainbow, Rockport, snow storm, to-do list9 Comments on No friday list? I learned of a knitting retreat from One Lupine, a local yarn shop, that will be held nearby this year, but in the Orkneys, Scotland next year. Immediately I began calculating how to get enough money to go and how not to feel guilty about spending all that money on something A could care less about. It will come to me, I hope. I have long wanted to go there. 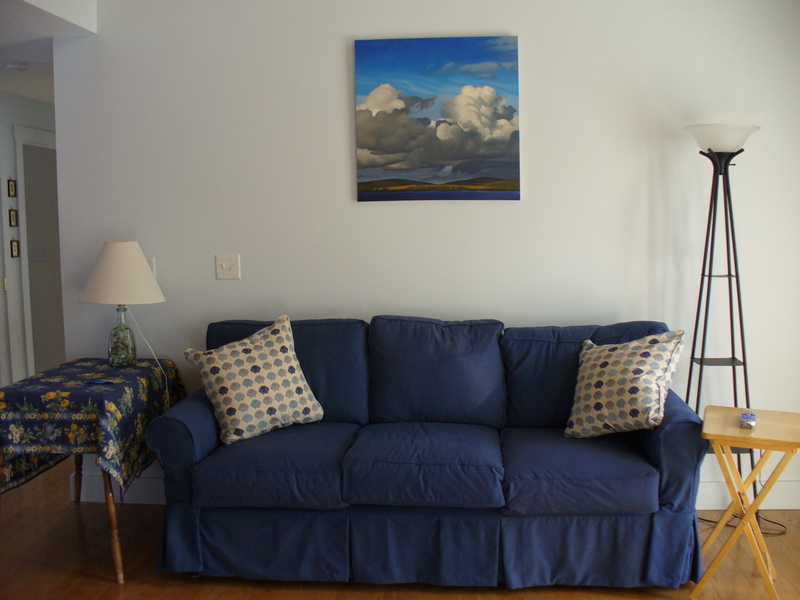 My mom and sister have been, and I have a painting hanging in my living room which my sister painted from her trip there. It seems like a good opportunity to get there, and knit as well. We will see, I guess. It is more than a year away. I strung the beads for four necklaces, which I hope to work on this weekend. Three are to give away, one is to sell. The three (black, blue, and purple) are for a coworker and her two daughters. I had to load printer drivers and do security updates on 5 tax computers yesterday, so while I waited to click “Next” I strung beads. All set now. 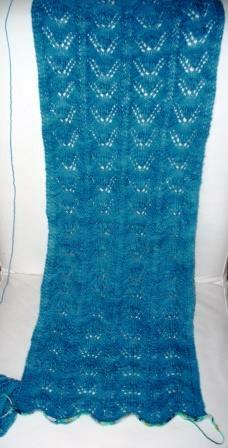 Meanwhile, I keep knitting on the blue sleeves, they are officially 8 inches long (un-blocked) so I AM getting there. I do have to figure out, at some point, how long I really want them. They are quite open at the cuff, so I think I will make them a tad shorter than longer, so I don’t get hung up in them when I wear the sweater. I told you my mind was whirling! Shoveling. Lots still to do to get cleaned up in preparation for another foot of snow coming tomorrow and Saturday. Sort out tax stuff, pack my boxes in preparation for Monday’s first day. Clean something. Almost anything would do at this point. We have tracked in so much muck this week. Fill the bird feeders. the little guys are quite hungry in this cold weather. Start reading. I got three books from the library today – one is Orphan Train by Christina Baker Kline which is our next book group selection (for March 2. Can you believe how ahead I am?) The other two are Still Alice by Lisa Genova and Lila by Marilynne Robinson. Of course, I should first finish the one I am reading now, The Gods of Guilt, by Michael Connelly. It turns out my forecast was pretty accurate, although the wind *might* have been more fierce than I expected. We got about 14-16 inches of snow, I would guess, although there is no place to really measure it accurately, that is what the towns around us report. It is still snowing lightly, but the storm is pulling away, and we should see sun this afternoon. Yeah! In spite of my shoveling the vent out periodically all day Tuesday, it still clogged and so we have no hot water or radiant heat until the plumber comes over. I called early, they will call me back when they get a feel for the schedule. Since we have electricity, we have our pellet stove and of course, the wood stove in the cellar, so the house is quite warm. However, that means that I have to stay close to home to keep fire going and pellets in the hopper. And today is the day I was to head over to Mom’s for a visit. I am bummed. Not to mention the lack of hot water for washing people and dishes and laundry… also a bummer. Here’s another shot of something with progress to show – at last! 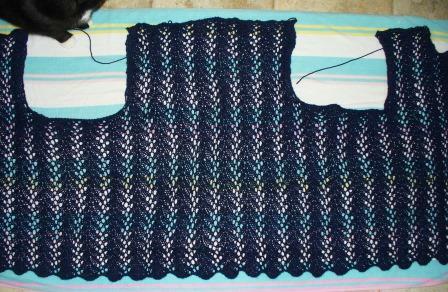 The blue sweater body, all blocked and drying out, waiting for me to finish knitting the sleeves, which are about 3 or 4 inches long at the moment. I did go out around 10, and will again in a few minutes – we have to make sure to keep the vent for the hot water clear or we have no heat. That would be bad. 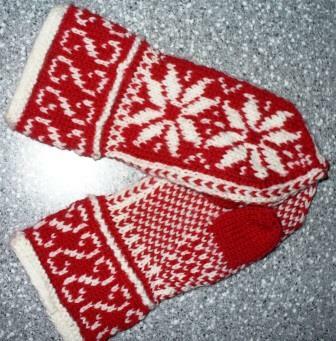 Going out there this morning made me wish I had finished my warm mittens, so I am working on them today. I hope to get them done this afternoon. 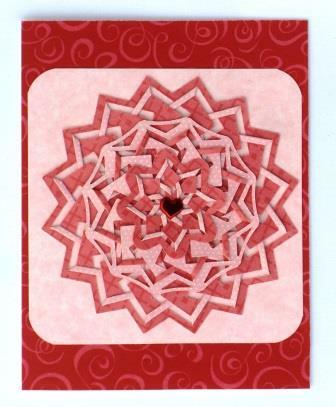 I also worked on some valentines, which I put up for sale over at Etsy. I made a similar one to give to A. That is one trouble I can foresee – making things to sell and still making fresh things for family…Do I just make tons, put them up for sale, give what doesn’t sell? Or make duplicates? Or make completely different ones? I suspect I will do all of these at some point. But for now, it is immaterial as nothing has sold. 🙂 I’ll use them for family if they are still here in a week or so. Now, out to shovel, then back to knit mittens. Author salpal1Posted on January 27, 2015 January 27, 2015 Categories Uncategorized9 Comments on Snow Day! Are these goldfinches, pine siskins, purple finches, or something else entirely? They look like the cross bills in my bird book, except that I can’t see if they have crossed bills. Sort of important, I know. I did not get a picture, but did see a pair of little woodpeckers – downy, I believe, at the suet the other day. They are so cute! Haven’t seen their big brothers pileated in a while, I wonder if they are still around? huge flocks of mourning doves and chickadees also rule the yard. While I miss Frankie and Tigger, I am glad that Allie and Zumba are indoors girls so we can feed the birds and see them up close! Author salpal1Posted on January 26, 2015 January 26, 2015 Categories what I am thinking about, What I loveTags birds, outside my window10 Comments on Birders, please advise! Well, OK, this is yesterday’s photo, I can’t keep up with a shot a day, it turns out. Visible progress is being made on this piece, and I can’t wait to have it done so I can WEAR it! Forgive me if I find it difficult to buy into their wild stories. They get so darned excited that it goes to their heads, I think, and they predict wild and crazy things, then they back off of them, then afterwards, no matter what happens, they can say they predicted it. Oh, and lest we decide to let that snow hang about uncleared for any length of time, Thursday night into Friday, we are getting more, as yet unspecified amounts, except that it will be “plowable.” Another few inches at least. So, this fine Monday, A is home (previously scheduled) and we will clear off the paths and decks in preparation for more snow. I’ll fill water jugs, charge cell phones, etc. We already have candles and flashlights out for the season, and so are in pretty good shape for a few days of storminess. I roasted a chicken yesterday, so we have leftovers ready to be warmed up. Life is good for the moment. Of course, Tuesday, A is scheduled to go to Brownville, but I suspect that won’t happen. She may have a mini-vacation this week! Wednesday, I am scheduled to spend the day with Mom, but that may be only half a day, or get rescheduled as well. We will see. That would be a shame, as we had a hard time finding this day, when we were both free. Taxes start next week, so my weeks become instantly full. Thanks, Mother Nature! Get it out of your system now, please, and then go back to sleep.